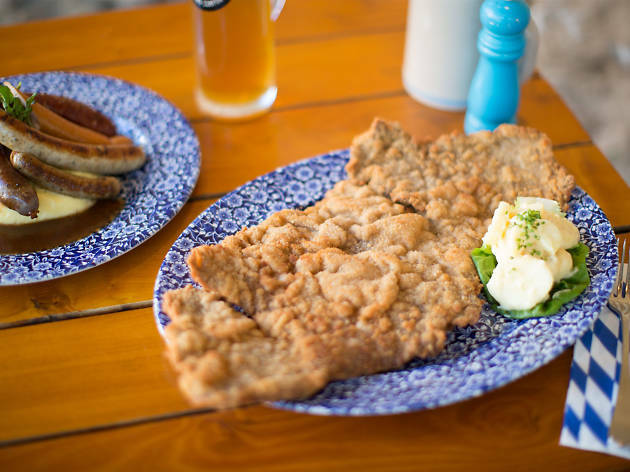 What goes into the perfect schnitzel? Worldwide icon-chevron-right South Pacific icon-chevron-right Australia icon-chevron-right Sydney icon-chevron-right What goes into the perfect schnitzel? If there’s one thing that UPG knows how to do, it’s schnitzel. 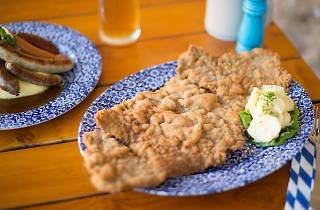 With a portfolio of ten Bavarian Bier Cafés, two Munich Brauhaus bier halls and a new fast casual spin-off, the Bavarian, they get a lot of practice at flattening and crumbing cutlets before frying them to a golden crisp. 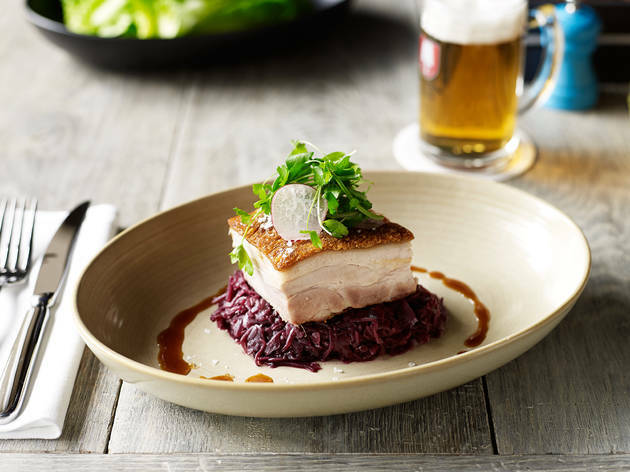 According to Martin Heierling, culinary director, Urban Purveyor Group, they cook an impressive 5,300 schnitzel per week, plus 60-odd 500g Duke schnitzels and 67 monster one-kilo Schnitzelmeisters. According to Heierling, the classic pitfalls for a schnitzel chef are cooking temperature and meat thickness. “You need to use a shallow fry pan and get the heat right prior to cooking. Having the meat too thick will overcook the crust, and too thin makes the meat dry,” he says. Just when you thought that a bowl of vanilla ice cream couldn’t possibly get any better, your local Chinese restaurant figured out a way to crumb it and fry it so that you get to eat a sweet snowball covered in a hot, crunchy shell topped with chocolate sauce. Some might consider deep-frying cheese gilding the lily, but those people need to pend some time in a Central European restaurant where they take camembert, crumb it and fry it so that the centre is extra melty. Rice is an excellent meal base. It’s great as risotto, fragrant with chicken stock, herbs, onion, mushroom and cheese. It reaches its flavour zenith when you ball-up the flavoured rice with a heart of cheese or ragu, crumb it and fry it for the perfect hot pocket. Opinion on the corndog (aka dagwood dog) is divided. Fans swear by the cornmeal batter that they wrap around a frankfurter before frying it on a stick. Made fresh, they are guilty pleasures that need only a cap of tomato sauce to perfect their appeal. We owe a great debt to the person who first took a small cephalopod, cut it into rings, crumbed them, fried them and squeezed a little lemon juice on top. If your local fish shop gets their calamari rings right they’ll have fans for life. Wanna learn what beer to pair your schnitzel with? There aren't many dishes that can't find their perfect match in a hoppy ale, a cleansing lager or a malty brew. Don't believe us? Give these beer and food pairings a try.